Clinton, Michigan - Eden Foods expands its line of 4 ounce resealable standing pouch snacks with three New snacks featuring Canadian certified organic berries. Eden® Organic Dried Cranberries ~ Organic Cranberries, Organic Apple Juice Concentrate, Organic Sunflower Oil. Hand harvested ruby red organic cranberries. Apple sweetened with no refined sugar or sulfites. A tangy, sweet flavor delivering healthy antioxidants. Eden® Organic Dried Blueberries ~ Organic Wild Blueberries, Organic Apple Juice Concentrate, Organic Sunflower Oil. Hand harvested wild blueberries, naturally dried, fiber rich and very low in sodium. Sweet and tangy, tiny berries with the biggest antioxidant health benefits. Eden® Organic Wild Berry Mix ~ Organic Dry Roasted Almonds, Organic Dry Roasted Pumpkin Seeds, Organic Raw Sunflower Seeds, Organic Raisins, Organic Cranberries, Organic Wild Blueberries. 100 percent organic blend. No salt added, rich in magnesium, and a good source of dietary fiber and protein. Eden's dried wild blueberries and cranberries are grown on organic family farms in Quebec, Canada. The berries are hand harvested, sorted, cleaned, flash frozen and infused with organic apple juice concentrate, slowly low heat dried, and coated very lightly with a mist of organic sunflower oil to prevent clumping. Wild blueberries (Vaccinium angustifolium) are prized for their intense flavor and color. For centuries they were gathered from the fields, forests and bogs of North America by Native American tribes. Because the blossom end or calyx of each berry forms the shape of a perfect five pointed star, it was called the 'star berry' and tribal elders often told stories of how the Great Spirit brought the star berries so that children could relieve their hunger during a famine. Today, most blueberries are the much larger cultivated, or high bush variety brought to North America from Europe. While both types of blueberries contain healthful antioxidants, it is the wild 'low bush' blueberry that was recently rated #1 in antioxidant activity of all fruit. Eden Organic Dried Cranberries are a native North American variety (Vaccinium macrocarpon) organically grown on family owned cranberry bogs in Quebec, Canada. Cranberries were first used centuries ago by Native Americans. To the Delaware Indians cranberries were a symbol of peace. Many Native Americans believed that the berries had a special power that could calm the nerves. Their current name comes from early Dutch and German settlers who named the fruit 'crane berry' because its small, pink blossoms resemble the head and bill of a crane, though some say they were named so because migrating cranes love to eat them. The USDA recently rated wild blueberries #1 in antioxidant activity and found that the high phenolic content in cranberries also delivers a potent antioxidant punch, rating it one of the highest out of 20 common fruits. To determine the antioxidant activity of various foods the USDA uses a system referred to as Oxygen Radical Absorbance Capacity (ORAC). By testing the ability of foods and other compounds to subdue oxygen free radicals, researchers were able to determine each compound's antioxidant capability. The ORAC value of wild blueberries is 2,400 and that of cranberries is 1,750. A study released at the 2004 International Conference on Longevity suggests that certain compounds found in blueberries and cranberries have a significant impact on cognitive health in aging. In addition, cranberries recently became the first fruit to carry a certified health claim in France, citing their benefit to urinary tract health. Today's commercial snacks deplete energy and well being as they are adulterated with unnecessary toxins. Experience the difference Eden offers, snack food that satisfies our natural snacking needs while providing good food benefits. Each one is made from wholesome ingredients using innovative natural preparation techniques, is low sodium with no harsh refined salt, has no hydrogenated oils, no preservatives, no sulfites, and only the finest organically grown seasonings. 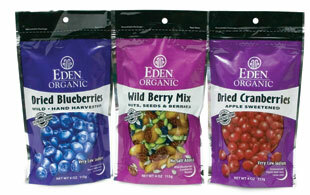 Eden 4 ounce snacks now come in nine SKUs. All are low or very low sodium, kosher parve, and packaged in easy to open, resealable bags for on the go anywhere, anytime convenience. Each snack is boxed, 15 bags, in ready to merchandise display units. Each bag is also hole punched for strip displays.